I think this is an excellent question, so I am passing it along to the readers of this blog. One suggestion: you might want to use my world famous Bayesian update worksheet. Hint: This question is similar to one I wrote about last year. In that article, I started with a problem that was underspecified; it took a while for me to realize that there were several ways to formulate the problem, with different answers. Fortunately, the problem posed by Riya is completely specified; it is an example of what I called Scenario A, where there are two tests with different properties, and we don't know which test was used. For each of these hypotheses, it is straightforward to compute the prior probability and the likelihood of a positive test. From there, it's just arithmetic. After the update, the total probability that the patient is sick is 10/26 or about 38%. That's up from the prior, which was 1/5 or 20%. So the positive test is evidence that the patient is sick, but it is not very strong evidence. 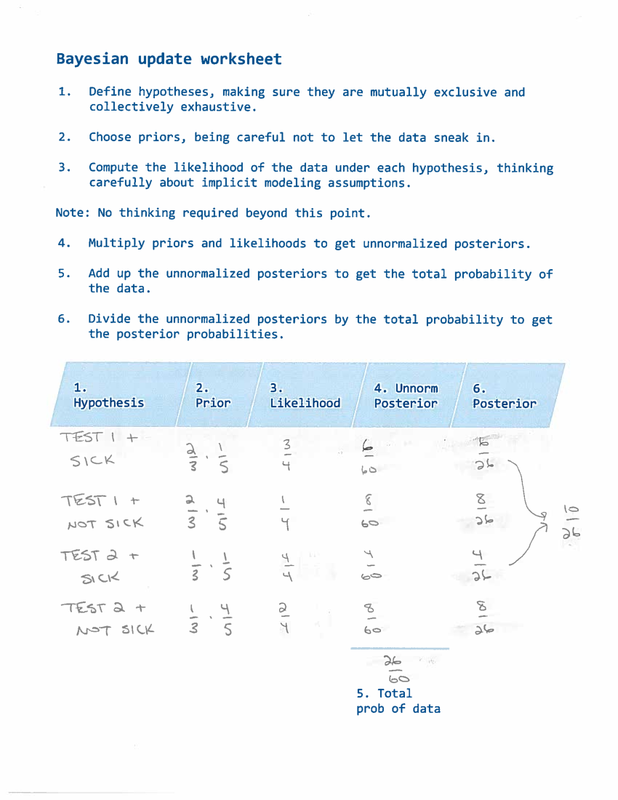 Interestingly, the total posterior probability of TEST2 is 12/26 or about 46%. That's up from the prior, which was 33%. So the positive test provides some evidence that TEST2 was used.